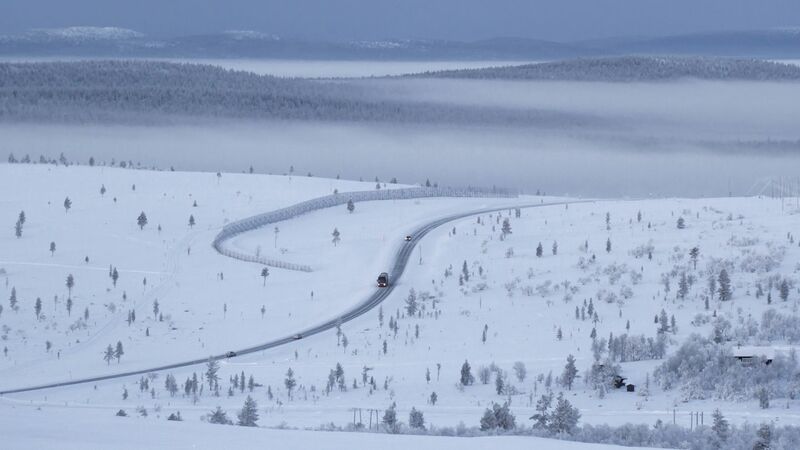 Driving in Lapland in the winter can be an adventure unto itself. Our most popular season lasts anywhere from 5 to 8 months in Lapland, depending on weather, climate and location. Here are some good tips to keep you safe and on time. When autumn cools and the long dark days of winter approach, nighttime temperatures often drop below freezing, especially on road surfaces. When driving in autumn (and sometimes late spring), pay attention to the road surface and watch out for black ice. It might look like water or dry road, but it’s frozen. As semi-wild reindeer make their way back to their home farms during the autumn migration, it’s pretty common to see them foraging on the side of the road. 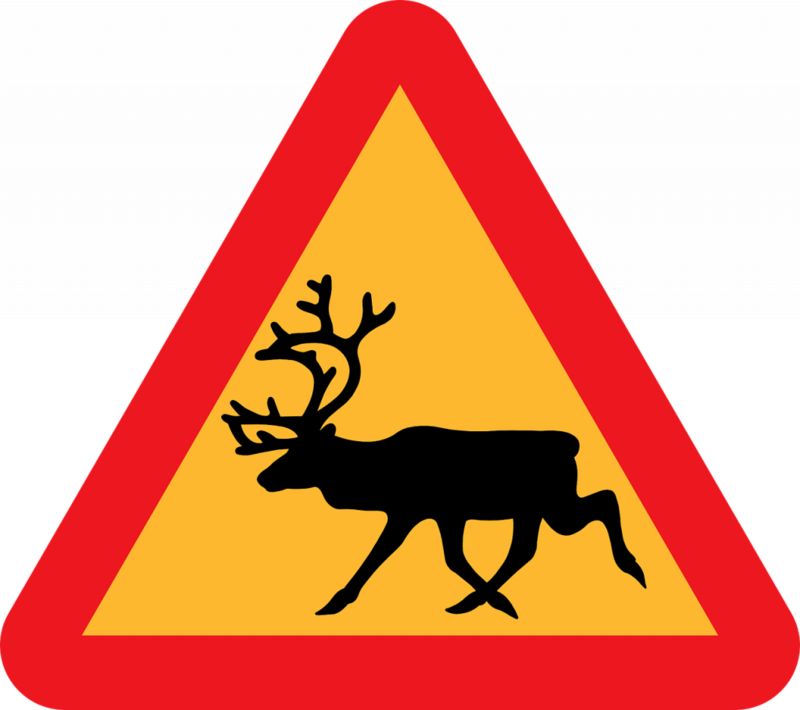 Be warned: Lapland is reindeer country, and they know it. They often will ignore you or walk on the road in front, behind or beside you. Elk, on the other hand, are the rhinoceroses of Finland, big and cantankerous. They are completely wild, meaning they will attack when threatened. If you come across an elk, stop immediately! Do not take photos. Wait for the elk to go about its business. Porokello is an app (Android and iPhone, for Finnish phones only) and in-browser web servcie (beginning early 2019) that crowdsources reindeer and elk sightings. When the temperature drops below zero, it’s a good idea to use the engine heater for a while before taking off, if possible. Virtually every car sold and rented in Finland has an engine heater, and it works by plugging it into a regular power outlet. For 0°C, heat up your car for ten minutes. At -20°C, give it a couple hours. Don’t run the heater for more than two hours–it doesn’t make the engine any warmer, and it’s a waste of energy. For more info, ask your rental car company or check the car manual. When it gets cold enough that the Fahrenheit and Celsius meet over a cup of hot cocoa (-40°), there is the possibility of a dead battery. If this happens, call your rental car company or a friend. Special note for electric cars: Electric car batteries will work in Lapland’s climates, but you might expect reduced range from the batteries due to the cold. Keep that in mind when planning your journey. Of course, ice on the roads is a real possibility. But we’re talking everywhere. Having the locks on your car doors freeze can happen. Not to worry. You can purchase de-icer to free up your lock, and use the mechanical key on your fob to get inside. But you still have millimeters of ice covering every window surface. Don’t become an Internet viral video by throwing boiling water on your windshield. More likely than not, you’ll need to buy a new windshield. Instead, grab your ice scraper and apply elbow grease. Scraping takes time, but it won’t damage your windshield. Don’t forget to gently free your wipers and scrape the ice off those as well. If there’s snow, you’ll probably spend a few minutes brushing your car. If it helps, you can talk to your car while brushing, like a pony. Despite our love of heavy metal, Finland doesn’t wear chains on its tires. Instead, from December 1st to March 1st, all cars must have winter tires. If you’re driving from somewhere else, be aware that it’s not just a good idea to have winter tires – it’s the law. Rental cars in Lapland will always have winter tires when the season or law dictates. Above all, remember to drive carefully– winter tires aren’t magic. Passing trucks often throw up snow, especially when there’s a layer of fresh powdery snow. This can create a beautiful but dangerous sparkling mist. Be aware and drive safe. It’s a great idea when driving in Lapland in winter to carry along winter clothes. In case of an emergency, or a sudden adventure into the snowy landscape, you should have a warm hat, scarf, winter coat and/or winter layers, gloves, winter pants, and a pair of winter boots. In case of an emergency, whether it be a car accident or otherwise, you can always call 112. This is Finland’s police emergency number. 112 dispatchers speak Finnish, Swedish and English and can get you the help you need. No one likes to get pulled over for misunderstanding or being ignorant of the law. Here’s a handy list to remember, whether it’s winter, summer or somewhere in between. Always wear a seatbelt, even in the backseat. Always drive on the right-hand side of the road. Always follow the posted speed limits. Never use your mobile phone while driving (without a hands-free). Here’s a handy guide on driving in Finland from the Finnish Road Safety Council and Motor Insurers’ Centre. Looking for more information on a Lapland holiday? What clothes do you bring to Lapland in December? How do you sleep under the Midnight Sun? For these answers and more, check out our FAQ.